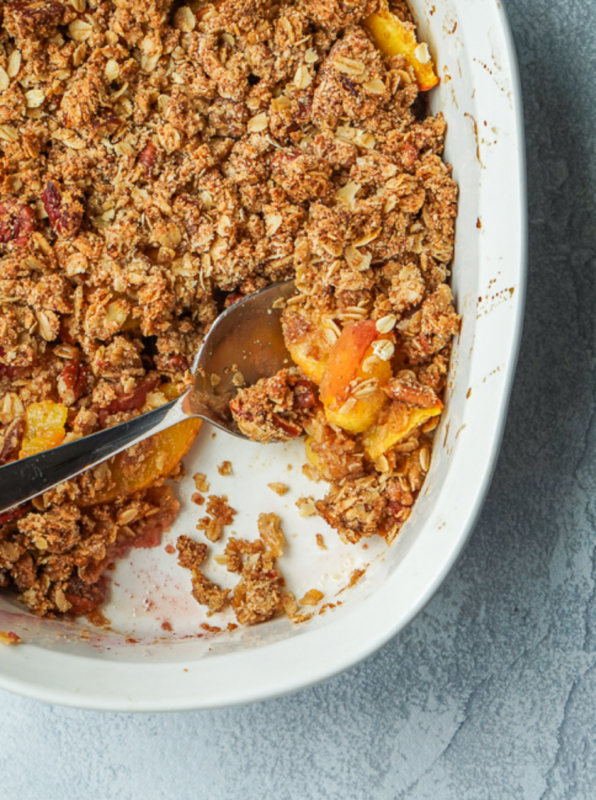 This Healthier Peach Crisp recipe is full of juicy peaches, naturally sweetened, and with a tasty crumb topping. Served with a scoop of vanilla ice cream it makes the perfect seasonal dessert. It’s Summertime! Which means we should be celebrating by spending time in the sun and eating all the fresh fruits and ice cream right! Lately on Saturday mornings we’ve been waking up and going to the local farmers market to purchase coffee and fresh produce. Peaches are one of our favorite seasonal fruits and we find the juiciest peaches can be purchased from local farmers. And when arriving home we can’t wait to get baking sweet treats the whole family will love. This Peach Crisp recipe is just that, quick and easy to make and only requires a few ingredients. To make the Peach Crisp healthier we swapped out a few ingredients. We use almond flour and oats to replace all-purpose flour, coconut oil for butter, and maple syrup and coconut sugar for refined brown sugar. These simple swaps provide more fiber, nutrients, and healthy fats to the dish. We are all about balance here, which means we believe we don’t need to deprive ourselves when our sweet tooth kicks in. We know some days eating a plain piece of fruit just doesn’t satisfy the way a chocolate bar does. This Healthy Peach Crisp recipe is the perfect balance for a better for you dessert. 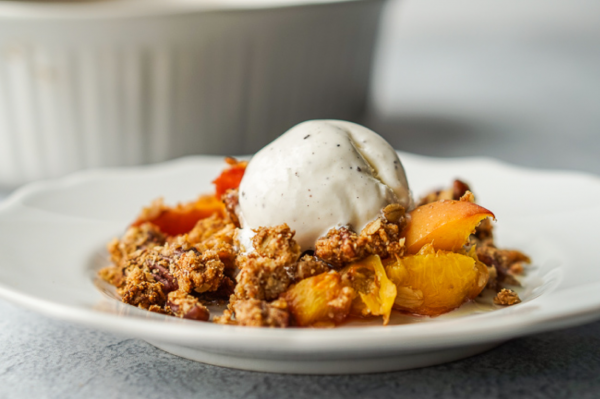 The Peach Crisp is delicious on it’s own, but we like to serve it with a scoop of our favorite vanilla ice cream. Just one bite for the taste of sweet sweet Summertime. Preheat oven to 350 degrees F and lightly coat a 8x8 or similar size baking dish with coconut or olive oil. Place sliced peaches flat on the bottom of the baking dish. In a medium bowl combine the oats, almond flour, pecans, coconut sugar, cinnamon, and salt, stir to combine. Add the maple syrup and coconut oil and use your hands or a wooden spoon to combine until crumbly. Add the crumb mixture to the top of the peaches and evenly distribute. Bake for 35-40 minutes or until the top is crisp and golden. Remove from oven and let cool before serving. We like to add a scoop of vanilla ice cream to each serving. Recipe by Patty Petre - http://sweetandstrongblog.com/. Patty grew up in Cleveland and is a graduate of Ohio University. She has taught middle school math and elementary physical education in southern MD since 2006. She is a Les Mills BodyPump and AFAA certified group fitness instructor. She shares her healthy lifestyle journey of finding balance between working out, eating healthy, and still indulging in the foods she loves on her blog; Sweet and Strong. During her free time she enjoys trying new workout classes, cooking, and watching sports at home with her husband and dog Blitz.